Always make sure that the wraps of your batteries are in pristine condition. If you notice a nick on the battery wrap, the safe thing to do is to re-wrap it. Battery wraps are cheap and very easy to put on. If you don’t have wraps, visit your local vape shop. Most shops will wrap your batteries for free and it won’t take more than a couple of minutes to do. Never throw batteries in pockets or bags when not in use. Get yourself some cheap plastic battery cases instead, as unprotected batteries might short circuit when they come in contact with metal objects. This may cause your battery to vent and potentially explode. If possible, try to not completely drain your batteries — lithium-ion batteries tend to lose more capacity the further you let them discharge. Most mods will come with some form of battery level indication. Taking your batteries out to charge before they are completely drained will prolong their life, i.e. the amount of cycles you will be able to get out of them. Vape batteries can tolerate low and high temperatures, but you wouldn’t want to test their limits. Higher temperatures will strain your batteries, making them age faster (or even vent), while colder temperatures take a toll on battery capacity. Make sure you store them in a cool place away from sunlight and never ever leave them stored in places like the glove compartment of your car where temperatures might even exceed their safety range. If you live in an area where the temperatures frequently get extreme, consider carrying your vape device and batteries in a small insulated lunch cooler. Batteries are only good up to a certain amount of cycles (full charge to full discharge). Lithium-ion batteries will start losing capacity and strength when used extensively for longer periods of time. If you sense that your battery takes less time to discharge, just replace it. Even if you haven’t noticed something out of the ordinary, replace your batteries after six months to a year, depending on how often you use them. When replacing old batteries, always recycle them instead of throwing them away. A lithium-ion cell can easily short-circuit in the trash can, which is a serious hazard risk. On top of that, recycling batteries is good for the environment. Keep an eye for battery disposal boxes and follow safety instructions when recycling your old batteries. 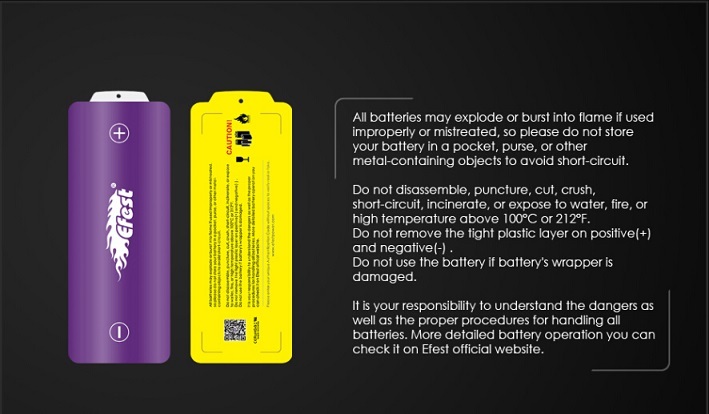 Batteries come with manufacture warnings. Make sure you follow them. The information on this page is for reference only. Other safety measures may need to be taken.